This riff on Spaghetti alla Gricia sprang from seasonal necessity. This seemingly spartan yet voluptuous pasta dish from Rome is a reliable standard in our house. We usually finish it with a garnish of parsley but have yet to set up any indoor herbs, and it was just too dark and cold to go foraging in the garden. Thinking on what was in the fridge that could substitute, we remembered the bin of chard and kale we harvested earlier. 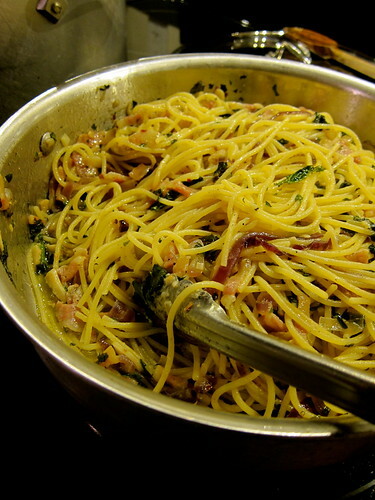 Spaghetti alla Gricia is also known as Amatriciana in Bianco, a “white” version of another traditional Roman pasta, with the tomatoes omitted. In her authoritative book, The Food of Rome and Lazio, Oretta Zanini de Vita’s recipe for Spaghetti alla Gricia lists garlic among its ingredients. However, whether to include garlic and/or onions is a matter of dispute. Purists feel these ingredients mask the delicate flavor of the guanciale, which, along with the peperoncino, or hot chili pepper, and Pecorino cheese make up its essential components. 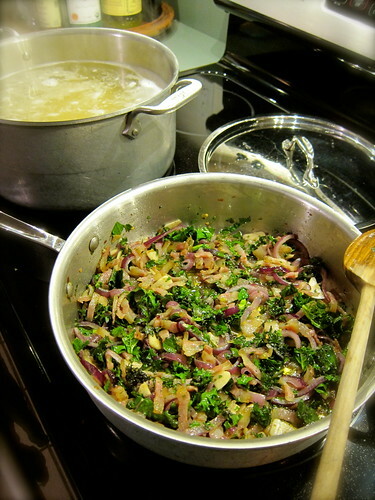 Here, we’ve strayed by adding kale, and the garlic and onions turn this dish into something hardier. We like to believe that by using what’s at hand, we’ve at least kept to the spirit of Italian cuisine. As for the guanciale — also known as cured pork jowl or cheek (la guancia) — it’s a favored form of cooking fat of the region around Rome. Its particular flavor comes from the herbs found in that area, infused through the animal’s diet and in the curing. Pancetta or bacon may be used it its place, the less smoky the better. For a more aromatic flavor, sauté the pancetta or bacon with a few juniper berries, removing the berries once the fat is rendered. Or, better yet, make it yourself. We think of this pasta bianca as midnight pasta, for after an imagined evening out carousing with friends and when over-indulgence calls for something settling. It can be made up quickly from pantry staples, and Popper’s Artisanal Meats provides us with guanciale made in-house and from locally-grown sources. If you’re lucky enough to have access to guanciale, this dish is the perfect showcase for it, imbuing it with a sweetly herbaceous porky flavor. The kale adds a mineral-rich counterpoint to the unctuousness of the dish, and we used a mix of Red Russian and Siberian. The idea of using Lacinato, an Italian variety, is particularly appealing, and ensures we’ll be adding kale to Spaghetti alla Gricia again soon. – Heat the oil in a large frying pan, add the guanciale and red pepper flakes, and sauté until the guanciale begins to crisp. Stir in the onions and garlic, and continue sautéing until tender. Add the kale and cook briefly, until wilted. Remove pan from heat. – Boil spaghetti in salted water until al dente. Add the drained pasta to the frying pan, and toss together, sautéing over medium heat for about a minute. Turn off the heat and stir in a handful of grated Pecorino cheese to finish. Serve at table with more Percorino on the side. 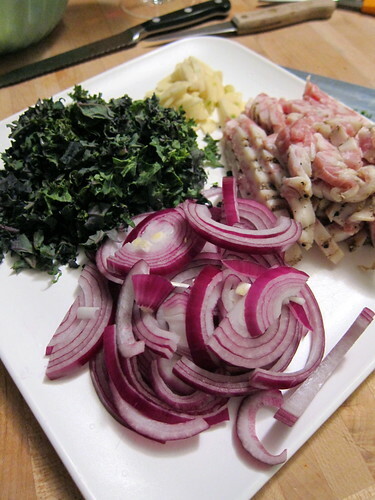 Local ingredients: Guanciale from Popper’s Artisanal Meats; red onion from Wake Robin Farm; garlic and kale from the garden. 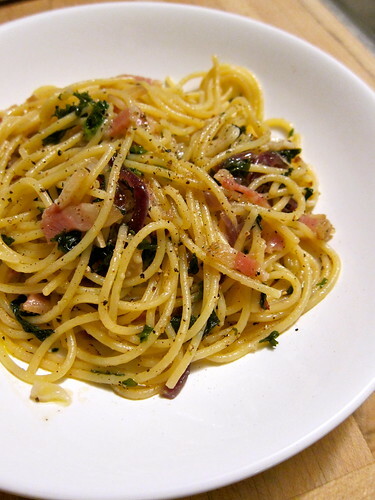 This entry was posted in cooking and tagged bacon, kale, pasta. Bookmark the permalink. This looks amazing! I am always in search of ways to make pasta without tomatoes – not that tomatoes are bad, I just like variation. And this would be easily adaptable to any of the wonderful greens you’re growing! I have some cavolo nero about to reach harvestable size – I now know what I will use the first harvest for. thankyou. Locally made guanciale? Lucky you! Indeed, it makes a difference. Love the idea of using kale in this dish.